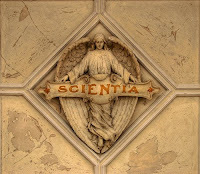 Inaugural edition of Scientia Pro Publica, The Science Blog Carnival, is up at GrrlScientist. This effectively takes over from The Tangled Bank, which PZ Myers inexplicably have left to rot. Those of you who go birding will know what I am talking about when I say that birds are so capable of reading human body language that they know when we are looking at them, which frequently causes them to hide from our gaze. However, this capacity has never before been scientifically studied in birds, until now, that is.